After 2013’s epic comeback album, Save Rock And Roll, Fall Out Boy returned bigger than ever, getting radio play and filling huge venues. So where to go from here? Well, if you’re Fall Out Boy, you make one of the catchiest albums ever. American Beauty/American Psycho takes Fall Out Boy’s brand of pop/rock and makes it even bigger. The band adds new twists on everything we love about them and it works – it works insanely well. First track, “Irresistible” is backed with a horn track and is probably the most fun song about a toxic relationship you could ever hope to make. “I love the way you hurt me, it’s irresistible,” Patrick Stump belts. “Centuries” is already a huge hit after being released as this album’s first single, and “The Kids Aren’t Alright” practically begs you to whip out a lighter and sway along to its huge chorus. “Uma Thurman” samples the theme song from The Munsters, and “Novocaine” has Stump hitting notes that are just insane. Stump’s voice sounds better than it ever has before on this record. He’s fully showcasing his range and there’s so much power behind his voice. Stump definitely has one of the best voices out there. 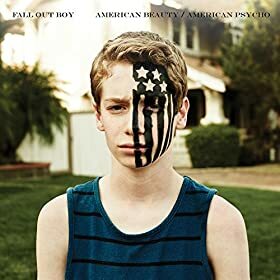 Every track on the album is amazing, but the clear standouts are “Irresistible” and “Uma Thurman.” Both songs perfectly showcase the changes in Fall Out Boy’s sound, but keep the bite in the lyrics that fans are accustomed to. They’re also arguably the catchiest songs on what is an extremely catchy record. “Irresistible” has a horn track that gets easily stuck in the listener’s head, while “Uma Thurman” makes you want to “dance like Uma Thurman,” just like the song says. Overall, the band sounds phenomenal. Instead of the standard guitar, drums and bass setup, they’re incorporating other instruments and sounds that add another level to their songs. After seeing how the world embraced their comeback, Fall Out Boy delivered a passionate album that shows spectacular growth and change, while still being the same band that fans fell in love with years ago. This is an album that’s made to fill the arenas Fall Out Boy is now playing, and get everyone in the audience up and on their feet. There truly isn’t a bad song on the album. 2015 just started, but American Beauty/American Psycho is already the one to top this year. American Beauty/American Psycho drops January 20th via Island Records.